yrh and pull through all loops. Rib - Working in back loop of stitch only, make 1ch, 1dc into base of 1ch, 1dc into dc to end. Turn. Rpt last row until 41 rows have been worked in all from beginning. DNT. Row 2 - 1ch, 1dc into base of 1ch, * make 1ch, miss 1dc, 1dc into next ch, * rpt from * to * end. Turn. Missing tr2tog's not dc's rpt Rows 2 & 3 seven more times until seventeen rows have been worked from rib or work measures approx 6 Inches from beginning. Turn. First Side - 1ch, 1dc into base of 1ch, * make 1ch, miss tr2tog, 1dc into next ch, * rpt from * to * eight times, 1dc into next tr2tog. Turn leaving 21 stitches un-worked. 3rd Row - 1ch, 1dc into base of 1ch, * make 1ch, miss tr2tog, 1dc into next ch, * rpt from * to * to last tr, 1dc into tr. Turn. 4th Row - 1ch, 1tr into base of 1ch, 1dc into next dc, * tr2tog into next 1ch space, 1dc into next dc, * rpt from * to * to end. Turn. Rpt 3rd & 4th Rows 5 more times until thirty one rows have been worked from rib or work measures approx 10 Inches from beginning. Fasten off. Second Side - Return to 21 un-worked stitches, miss 1dc, rejoin colour 1 to tr2tog, work 1ch, 1dc into base of 1ch, 1dc into next dc, * make 1ch, miss tr2tog, 1dc into next ch, * rpt from * to * end. Turn. Row Two - 1ch, 1dc into base of 1ch, * tr2tog into next 1ch space, 1dc into next dc, * rpt from * to * to last dc, 1tr into dc. Turn. Row Three - 1ch, 1dc into base of 1ch, 1dc into next dc, * make 1ch, miss tr2tog, 1dc into next ch, * rpt from * to * end. Turn. Row Four - 1ch, 1dc into base of 1ch, * tr2tog into next 1ch space, 1dc into next dc, * rpt from * to * to last dc, 1tr into dc. Turn. Rpt Rows Three & Four 4 more times until 31 rows have been worked in all or second side measures the same as the first. Fasten off. Sweater Front - Rpt from # to # on back. Missing tr2tog's not dc's rpt Rows 2 & 3 ten more times until 23 rows have been worked from rib or work measures approx 7.5 Inches from beginning. Turn. First Side - 1ch, 1dc into base of 1ch, * make 1ch, miss tr2tog, 1dc into next ch, * rpt from * to * five times, 1dc into next tr2tog. Turn leaving 27 stitches un-worked. Next Row - 1ch, dec 1dc (see abbrev) over first 2dc, * tr2tog into next 1ch space, 1dc into next dc, * rpt from * to * to end. Turn. Missing tr2tog's not dc's rpt Rows 2 & 3 from back three more times until thirty one rows have been worked from rib or work measures approx 10 Inches from beginning. Fasten off. Second Side - Return to 27 un-worked stitches, miss 13 stitches, rejoin colour 1 to next tr2tog, work 1ch, 1dc into base of 1ch, 1dc into next dc, * make 1ch, miss tr2tog, 1dc into next ch, * rpt from * to * end. Turn. Next Row - 1ch, 1dc into base of 1ch, * tr2tog into next 1ch space, 1dc into next dc, * rpt from * to * to last 2ch space & 2dc, work tr2tog into 1ch space, dec 1dc over 2dc. Turn. Missing tr2tog's not dc's rpt Rows 2 & 3 from back three more times until 31 rows have been worked from rib or work measures approx 10 Inches from beginning. Fasten off. Rpt last row until 27 rows have been worked in all from beginning. DNT. Increase Row 1 - 1ch, 2dc into base of 1ch, * make 1ch, miss 1dc, 1dc into next ch, * rpt from * to * to end, working 2dc into last dc. Turn. Increase Row 3 - 1ch, 2dc into base of 1ch, 1dc into next dc * make 1ch, miss tr2tog, 1dc into next dc, * rpt from * to * to last tr, 2dc into last tr. Turn. Missing tr2tog's not dc's on Row 2, rpt Rows 2 & 3 from back 5 more times until 15 rows have been worked from the rib or work measures approx 5.5 Inches from beginning. Fasten off. Assemble Sweater - With WS facing, ss loosely or over sew with needle and yarn shoulder seams together, fold sleeves in half lengthways, then placing centre folds to shoulder, ss or over sew into position. Join side and sleeve seams together by over sew or slip stitching. Button/Buttonhole Bands - (Written for a girl swap sides for a boy) With RS facing and colour 1, start on base of back split, work 19dc evenly into row ends up back edge, 3dc into corner, 1dc into each of next 7 stitches across top of back edge, 9dc down first front edge, 1dc into each of next 13st along front, 9dc up second front edge, 1dc into each of 7 stitches along back, 3dc into corner, 19dc evenly into row ends down second back edge. Turn. (87dc). Next Row - (Buttonholes) 1ch, 1dc into base of 1ch, 1dc into each dc up back edge, 3dc into corner, 1dc into each of next 16dc, dec 1dc over next 2dc, 1dc into each of next 11dc, dec 1dc over next 2dc, 1dc into each of next 16dc, 1dc into corner, * 2ch, miss 1dc, 1dc into each of next 6dc, * rpt from * to * once, make 2ch, miss 1dc, 1dc into each of remaining dc. Turn. Starting with 1ch, 1dc into base of 1ch, work 1dc into each dc and 2ch space to end. Fasten off. Return to button band, working from neck downwards, join colour 1 to centre dc of 3dc, 1ch, 1dc into base of 1ch, 1dc into each dc to end. Fasten off. Working in back loop of stitch only, make 1ch, 1dc into base of 1ch, 1dc into dc to end. Turn. Rpt last row until 8 rows have been worked in all from beginning. Fasten off. Finishing - Weave in and tie off any loose threads of yarn, sew on buttons to correspond with buttonholes, attach pocket to front of sweater. 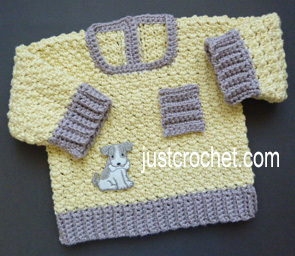 Hope you enjoy this free baby crochet pattern for a textured sweater.